Debbie O’Carroll is currently one of Queensland leading and most successful women’s national level coaches. Debbie leads a very successful team of coaches at our Bayside venue. Qualifications: Women’s High Performance Coach. Coach to many State and National champions. Representative roles: Team Coach and current Head Coach for Queensland Team since 1992. Three time Australian Team Coach for International competitions. Awards: Australian Sports Medal – 2000 for services to gymnastics. 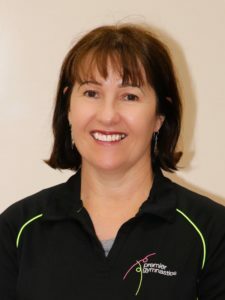 Three time Gymnastics Queensland National Levels Coach of the Year. One time Gymnastics Australia National Levels Coach of the Year. Awarded Gymnastics Queensland Life Membership for services to gymnastics. Current external roles: Presenter for Gymnastics Queensland congress and State Squad. Presenter for Gymnastics Queensland and Australia for Advanced coaches course. Guest presenter at interstate education events. Highlights of volunteer roles: 1992 World Championships training gym, 2000 Sydney Olympics Floor Manager, 2018 Commonwealth Games Team Leader competition floor.